Disjunctive application is a type of interaction between phonological mappings that has received special attention since the inception of generative phonology and has significantly impacted research in other subfields in linguistics. 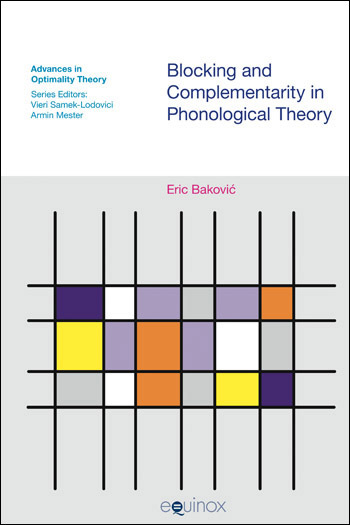 In this book, Baković argues that the principle commonly held to be responsible for disjunctive application, the Elsewhere Condition, is little more than a collection of necessary stipulations within Chomsky and Halle’s original framework of assumptions in The Sound Pattern of English. By contrast, disjunctive application is shown to follow automatically from the most basic assumptions of Optimality Theory with no added stipulations necessary. This book provides an in-depth discussion of the history and analysis of blocking interactions, of which disjunctive application is a special case. The distinguishing feature of disjunctive application is shown to be complementarity. The analyses of two types of complementarity (allophonic or ‘unbounded’ complementary distribution as opposed to ‘bounded’ complementary distribution) in both SPE and OT are discussed in detail, and it is shown that both have been analyzed very differently in SPE but very similarly in OT. The various stipulated components of the Elsewhere Condition are then discussed and contrasted with the lack of any such stipulation in OT. This is followed by a proof of two theorems within OT that solidify the result that two mappings in a particular formal relation to each other are bound to apply in complementary fashion.